Aberdeen-based John Lawrie Group has started the first quarter of 2011 strongly after securing a multi-million pound order to export recycled metal. The metal reprocessing, steel trading and environmental services company has secured a substantial contract with a Spanish steel mill, which will see its three Scottish recycling facilities process and ship over 50,000 tonnes of metal before the end of March. The exported material will be melted down and remanufactured into new steel products. The contract has also seen the company export its largest ever monthly shipment of recycled metal. 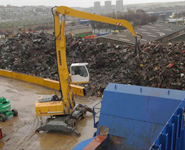 Last month through its Aberdeen recycling facility, John Lawrie processed and shipped around 20,000 tonnes of recycled metal, 14,000 tonnes of which were handled in 10 days. Operations director Dave Weston said: “February was one of John Lawrie Group’s busiest ever months processing and exporting scrap metal. To have processed and exported 14,000 tonnes of recycled metal in just ten days – and 20,000 tonnes in the whole month – is a huge testament to our staff. It also supports the investments which we have made in our facilities in recent years. Established in Aberdeen in the 1930’s as a scrap metal merchant, the John Lawrie Group now offers a diverse range of industrial services and has developed an enviable reputation for quality customer service. It is one of the country’s leading privately owned companies and has operations throughout the UK and in USA, Europe, the Middle East, and China, employing a 100-strong workforce.